John Force has been no stranger to making history in his storied career and he has the opportunity to do so once again this weekend. Force won the first two legs of the Western Swing in Denver and Sonoma and enters Seattle as the only driver with a chance to complete the sweep this year. A look at the numbers shows just how big of a deal this is. The sweep has happened only eight times. 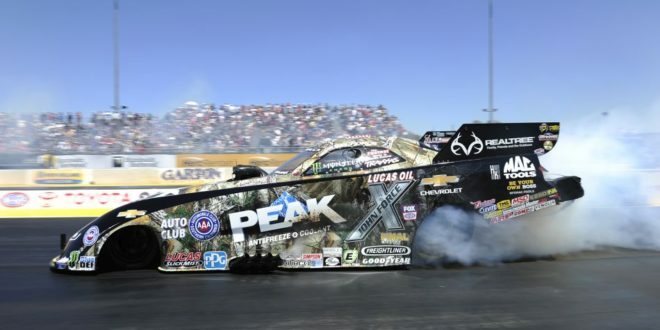 Of those eight, six have been accomplished in Top Fuel, while Funny Car and Pro Stock have one sweep each. The one time someone did it in Funny Car: in 1994 by John Force. If Force can complete the sweep, he would remain the only Funny Car driver to do so, and become the only driver in any class to do it twice. The gap between the first and second sweep for Force would be 22 years. Those numbers should make it clear just how difficult sweeping the three race Western Swing is. Force does have a few things going his way on this deal. He’s won in Seattle eight times before, most recently in 2014, so he does well at this particular track. Force has also won three races in a row twelve times previously. Obviously experience is on his side. John Force has pretty much been there, done that for just about anything you can imagine. Still, given the rarity of the feat at hand, whether or not he can pull it off will be the thing to watch this weekend. 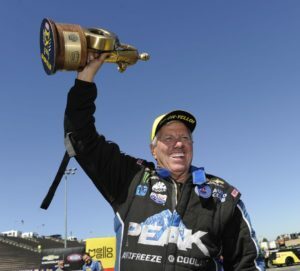 Just in case you were wondering, the full list of drivers who have swept the Western Swing: Joe Amato (1991), Cory McClenathan (1997), Larry Dixon (2003), Tony Schumacher (2008) and Antron Brown (2009) are the six Top Fuel winners; John Force (1994) is the only Funny Car winner; Greg Anderson (2004) is the only Pro Stock winner. * Alexis DeJoria, driver of the Patron Tequila Toyota Camry for Kalitta Motorsports, suffered a fractured pelvis after an incident during the first round of eliminations last Sunday in Sonoma. DeJoria’s car lost traction leaving the starting line and cut left, making contact with the wall. She got out of the car under her own power but immediately knew there was a problem. DeJoria was taken to the local hospital where X-rays revealed the fracture. She did not require surgery and was released from the hospital on Sunday. DeJoria planned to start physical therapy immediately but her status for the race this weekend in Seattle has not yet been announced. 2011 – Won four races in four final round appearances. 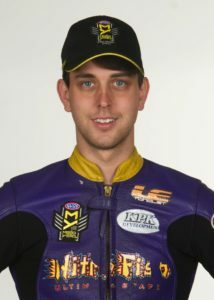 2010 – Won NHRA Mello Yello world championship in his rookie season, the third rookie to do so; won six races, including Indianapolis; won Auto Club Road to the Future award, NHRA’s rookie of the year. Here is a clip of the incident from last Sunday in Sonoma during which Alexis DeJoria suffered a pelvic fracture. This is the final 66 feet of the race track before the finish line and is the area where the top speeds posted for the run are recorded.